Silver Cloud is a Natural material. 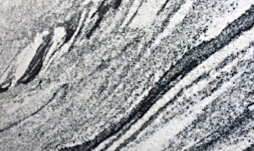 Silver Cloud is a Medium priced Granite stone. Silver Cloud is mostly Grey/White with the odd black waves swirling through it. It’s amazing swirling pattern makes it perfect for any sized island as a centre piece. Used in both traditional and modern designed kitchens it really is a good choice to make. We highly recommend that you chose your own material as each slab is unique. You will also find Viscount White which is very similar but not as stunning. Which is in are select granite range. This could be a good alternative and a cheaper option. Please take a look if we have any in stock. Silver Cloud is a Natural Granite from USA, Landford Stone offer this type of stone in a variety of thicknesses and finishes. Silver Cloud is a Medium priced stone and will look incredible in your home!